Let's start with the French designer Pablo Reinoso. For several years, he has been traveling around various countries leaving his "traces". We choose two the most interesting of his works. 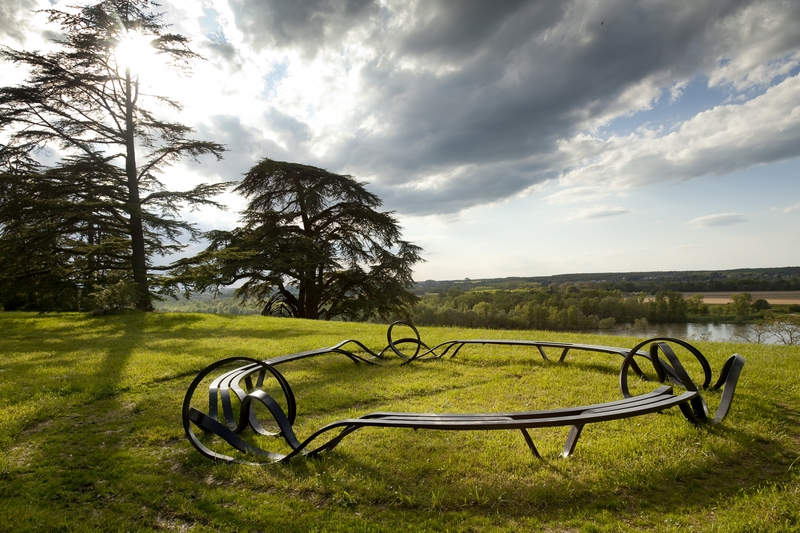 The first bench consists of only three metal plates and surprises with its form. One can sit on it while strolling near Sudeley Castle, in the UK. The second seat is a regular guest of various galleries and exhibitions, as its spaghetti will hardly find a place in the kitchen cupboard. On the territory of art spaces there are not only the benches which one wants to eat up, but champions in the number of legs. London-based designer from South Africa, Louis Henry was not scrooge to decorate his creation with 56 legs. But it is unlikely that one will sit on it, manual work is not intended for human weight. Well, okay, at least it is beautiful. 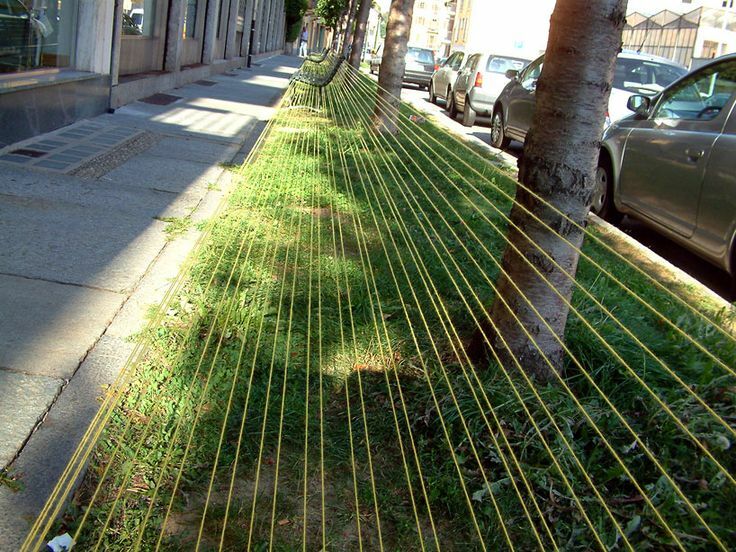 Another "unsitable", but incredibly original bench is located in the Italian town of Biella. It was designed by the Bulgarian designer Veronica Tsekova who is sure: people should not forget their past. That is why she has created a unique object from local yarn, which once made the town famous through the whole of Europe. Today the production of this material went into decline, so the local authorities by ordering this object somehow decided to remind the world and the citizens of the old times. High seat - distant view, it's said about weird, at first glance, Elevated Bench of Belgian design. It surely will be admired by those who like to look at others from above. Alas, the peace and quiet is not way close, because there is a street under the feet. If you still think that a bench is just a board on two stumps like it was 200 years ago, you're wrong, because many of them are confident with technical progress. The USA offer the so-called common Boom Benches with built-in speakers to which one can connect iPhone or iPod and please passers-by with playlists. And the Scots even went into a web. 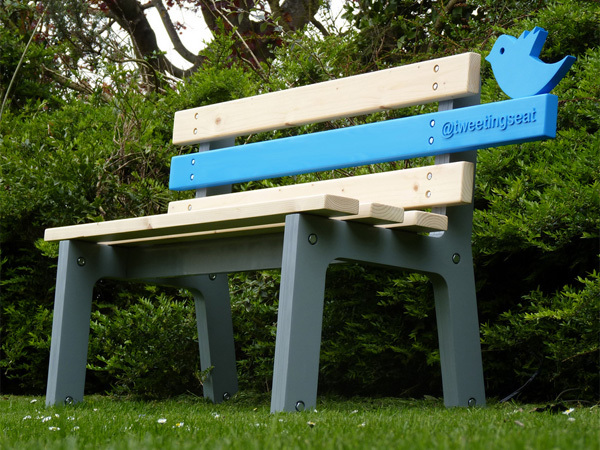 The park of Dundee city features a bench with Twitter account, which from time to time adds pictures with "visitors". This is done using a number of cameras installed nearby. 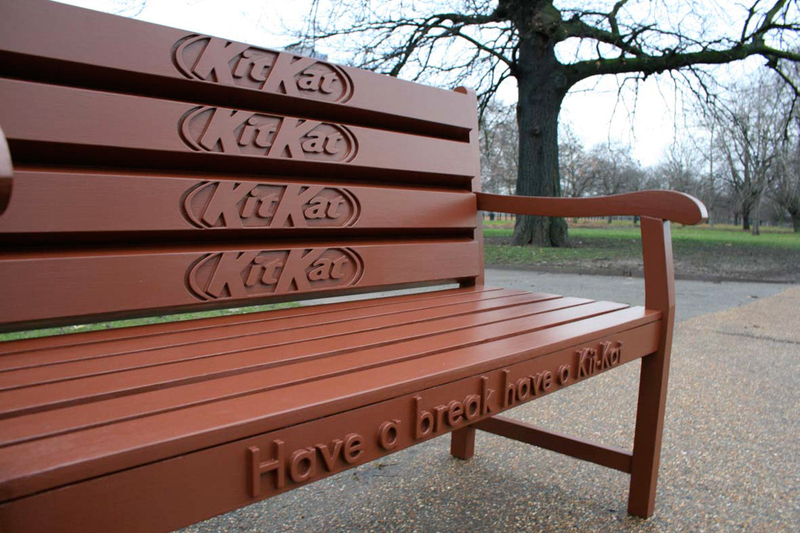 At the end let’s consider a bench not only as a place to relax, but as a promotional item. Occasionally odd ideas come into creative heads: and every new idea is weirder than the previous one. For instance, the Australian clothing brand Superette placed on benches stamps which reflect on the legs of beauties involuntarily advertising the brand. After sitting on the bench for at least 10-15 minutes, a wearer of a mini skirt or shorts is transformed into a walking billboard. This art holds not less than an hour. But the producers of the famous Becherovka decided that for the successful sale of products, the company is needed. Therefore, they produced special benches that connect people without asking their opinion. And if you are not interested in alcohol, then you can "get hooked" on chocolate bars, like Kit-Kat. And yet, my friends, sitting down always watch out what is at the bottom. This is useful not only when you have a work of art under you, but also in case a bench has been recently painted. So be careful!